The Anaconda Plan was General Winfield Scott's strategy to slowly strangle the southern rebellion by blockading southern seaports and seizing control of the Mississippi River. 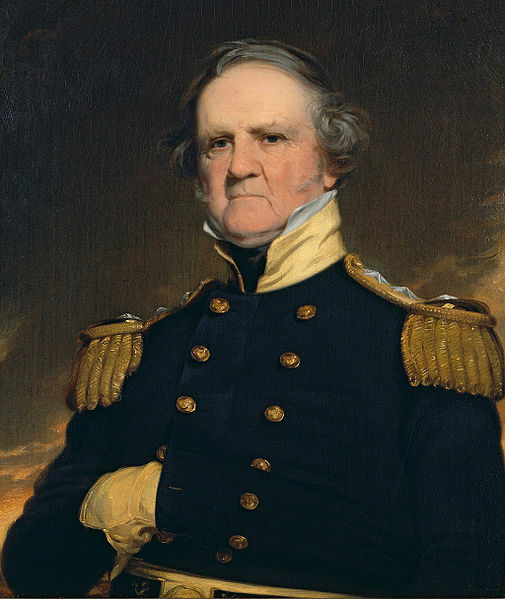 On March 7, 1855, Congress passed a joint resolution temporarily reviving the rank of lieutenant general to be “filled by brevet, and brevet only.” The bill also conferred the title upon Winfield Scott, to rank from March 29, 1847, to acknowledge his “eminent services of a Major-General of the Army in the late war with Mexico.” Five years after his appointment, Scott would be called upon to develop a strategy for leading the nation’s armed forces into the bloodiest conflict in American history. We rely greatly on the sure operation of a complete blockade of the Atlantic and Gulf ports soon to commence. In connection with such blockade we propose a powerful movement down the Mississippi to the ocean, with a cordon of posts at proper points, and the capture of Forts Jackson and Saint Philip; the object being to clear out and keep open this great line of communication in connection with the strict blockade of the seaboard, so as to envelop the insurgent States and bring them to terms with less bloodshed than by any other plan. Scott could not have been more correct, but he may have been unaware initially that McClellan was among those who championed bludgeoning the South into submission using the seemingly invincible military and industrial might of the northern states. As the young general lobbied to crush the rebellion by leading a campaign against the Confederate capitol at Richmond, he disdainfully likened the aging general’s more passive approach to the strangulation tactics employed by boa constrictors. Seizing upon McClellan’s derisive comparison, Northern newspaper editors began to sarcastically refer to Scott’s proposal as the Anaconda Plan. After his ascension, McClellan adopted a more measured approach to extinguishing the rebellion. Much to the consternation of the President, McClellan spent four months organizing the largest land force to date on the North American continent and formulating plans for a campaign up the Virginia Peninsula, as opposed to a direct overland assault on Richmond. McClellan finally launched his Peninsula Campaign on March 17, 1862. By late May, the Army of the Potomac was only six miles from the Confederate capital. Inexplicably, McClellan then lost his nerve and began a slow retreat in the face of stern resistance from General Robert E. Lee’s Army of Northern Virginia. The opportunity for a quick end to the rebellion was lost. What followed was the protracted war Scott had so earnestly wished to avoid. Tragically, the Civil War may have claimed the lives of as many as 850,000 Americans. Ironically, two of the primary elements of Scott’s Anaconda Plan to avoid the bloodbath – the naval blockade of Southern ports and the subjugation of the Mississippi River – eventually became two of the decisive factors that ended the carnage.